Ladies and gentlemen, let me introduce you to a little gem that gets me through those times when I'm craving something sweet and naughty. Ever heard of a fat bomb? I hadn't until I started my Keto diet journey. They sound kind of gross, don't they? Actually, fat bombs are so high in fat and low in protein that they help your body burn more fat for fuel and stay in ketosis. And when I say "fat," I'm talking about healthy fats. Here's the homeschooling mom coming out... we need these healthy fats to help our bodies absorb fat soluble vitamins like vitamin A, D, E, and K. Thanks, Apologia science! Anyway, back to the recipe. 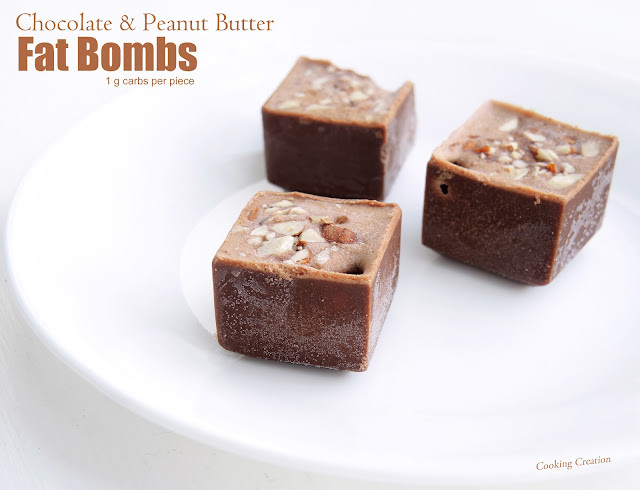 These chocolate and peanut butter fat bombs are amazing! 1 gram of carbs never tasted so good! Notes: The mixture will sweeten as it sets. Carb count will vary depending on the size of your silicone molds. Store in an airtight container in the refrigerator. In a medium bowl, melt the peanut butter, coconut oil and butter. Stir in the cocoa powder, Truvia nectar, and vanilla. Pour the mixture into silicone molds. Top with chopped almonds. Place in freezer or refrigerator until set.